“We would like to welcome all our existing families and those that have joined us later this year, we have had another busy swimming season and everyone was excited about the upcoming Commonwealth Games on the Gold Coast. Did you know that Andrew was instrumental in the successful COMMONWEALTH GAMES bid in St Kits & Nevis? Thus bringing the 2018 Commonwealth Games to the GC he also volunteered his time to be a part of the legacy that would remain after the games in 2018 by being a member of the Sport & Technical committee, Chairman of the Athletes Advisory Board, and member of the Queensland State Governments Legacy Committee for the Commonwealth Games. It was great to see all SUPERFISH CENTRE’S joined in the enthusiasm for the Commonwealth Games and they all were exceptional with the decorations and inspiring and educating the children on the upcoming event. Attending events ourselves and seeing families of SUPERFISH SWIM SCHOOLS watching and cheering our fellow athletes was a highlight of the Games for us this year. We are so proud to announce that Andrew has recently been appointed as a member of the Swimming Australia Board and in addition to this also appointed to the Board of the Australian Sports Foundation for a three – year term. “Andrew’s knowledge, passion and understanding of the sport will be a great asset to the board and we are very much looking forward to his contribution in the coming years. “said Mr Bertrand. Karen has also been attending and speaking at several Swim Australia conferences this year, her expertise in Babies and her passion for learn to swim is second to none. 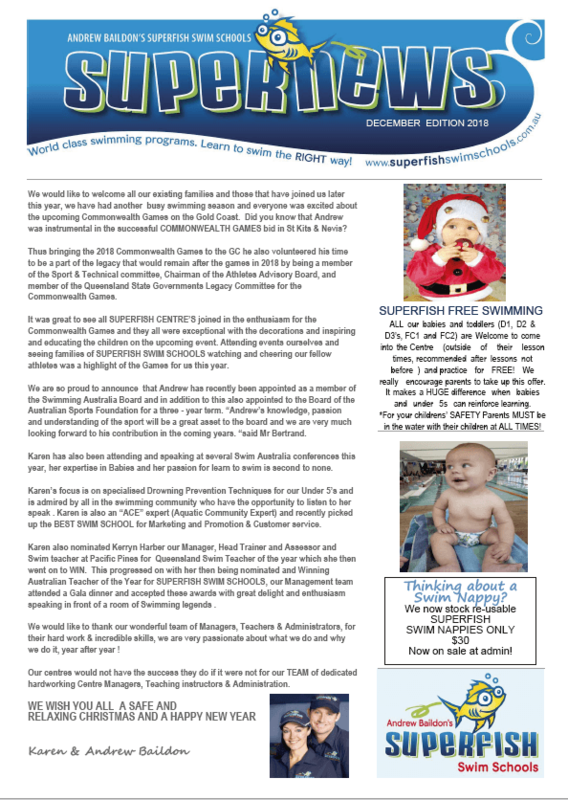 Karen’s focus is on specialised Drowning Prevention Techniques for our Under 5’s and is admired by all in the swimming community who have the opportunity to listen to her speak . Karen is also an “ACE” expert (Aquatic Community Expert) and recently picked up the BEST SWIM SCHOOL for Marketing and Promotion & Customer service. Karen also nominated Kerryn Harber our Manager, Head Trainer and Assessor and Swim teacher at Pacific Pines for Queensland Swim Teacher of the year which she then went on to WIN. This progressed on with her then being nominated and Winning Australian Teacher of the Year for SUPERFISH SWIM SCHOOLS, our Management team attended a Gala dinner and accepted these awards with great delight and enthusiasm speaking in front of a room of Swimming legends . We would like to thank our wonderful team of Managers, Teachers & Administrators, for their hard work & incredible skills, we are very passionate about what we do and why we do it, year after year ! Our centres would not have the success they do if it were not for our TEAM of dedicated hardworking Centre Managers, Teaching instructors & Administration.